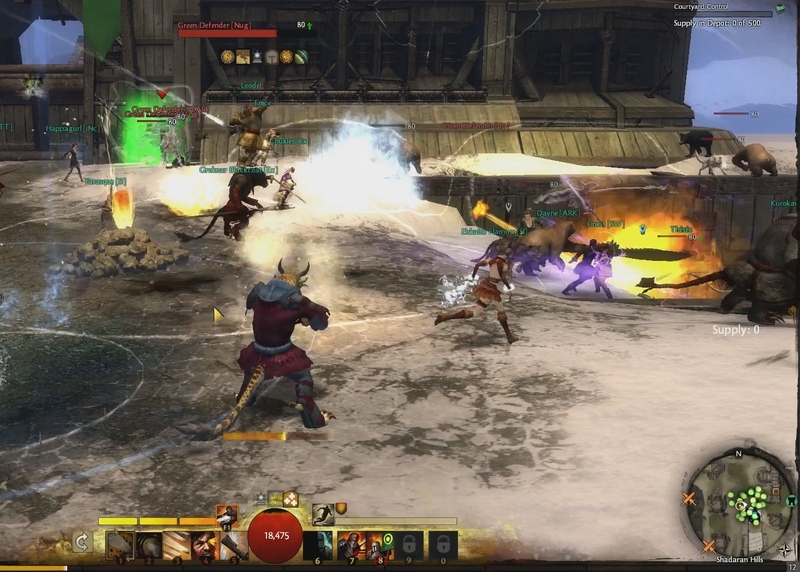 On May 14, ArenaNet had a second stress test for Guild Wars 2. After being in the loading screen, stuck at 95%, for about 10 – 15 minutes, I got into the game and didn’t have any problems at all anymore. Weird. ;) But maybe Monday evening wasn’t the perfect time for a stress test because lots of people have to work and can’t devote time to that. Saturday could have been a better choice or even Friday. At least, if they wanted to test the login servers. Either that or they have managed to improve their systems greatly (I certainly wouldn’t mind that ^^). Nevertheless, I was really tired and didn’t stay long in the game. I didn’t know my way around on the map, so I went to where bookahnerk said he had seen players from one of the two enemy realms. I’m fighting only with my gun because ranged seemed like the best option. As you can see, it takes quite a while to get a gate down. A ram can help a lot with that! Make sure to always carry a few supplies (I think 10 is max per player) with you in case somebody wants to build a siege weapon. As you can see, I spent most of my time attacking the gate, looking around and just trying to scare the enemies away from the pinnacles, so they would stop attacking those of us who stood on the ground attacking the gate. ;) I also tried to figure out when an enemy was “obstructed” and where they had to stand on the walls, so I could successfully attack them in ranged combat. I know that I’ll definitely enjoy playing my warrior with a rifle! Previous NBI: Why haven’t you started your blog yet? I honestly think we are only seeing the surface getting scratched as far as player behaviors and strategies in the WvW setting right now in the beta. Those will evolve significantly once the game launches. So many folks are just trying to get their feet under them and get comfortable with the basic combat mechanics initially… true mastery and experimentation only really occurs after that comfort is attained. It’s also very important to note that NONE of the characters in WvW during the betas were “true” level 80s, and having the full compliment of traits and skills accessible will doubtless have quite an impact on how players approach that aspect of the game. When I tried it I end up stumbling on the castle in the center of the map which was being held by an opposite server. Our server started to gather there and try to break the door down but as soon as we tried that, people from the opposing server came behind us and a big fight ensued. Since I am pretty lousy at PvP I died in a few seconds and decided to go back to PvE as there was still much to see. By looking at the WvWvW scores though it seems our server didn’t have much luck in breaking down that gate as the scores didn’t change much during the weekend. I loved the rifle for the “pew pew” feeling (yes, I am silly) but I think the bow can be useful when you need to do some AoE shooting. To me that is the cool thing about the warrior. Not only each weapon have a different feel but they all have different situations where they are more useful. Hmm… rifle/gun warrior for single target and AoE ranged damage. I wonder if that’s a viable build. Ah! I see. Thanks for the info! I do remember there were some stuff related to PvP on the guild window too that you could by with guild Influence. I just don’t remember exactly what it was now…. I need to pay more attention to it next time. But I am wondering if a purely ranged warrior works. I like meleeing but GW2 is still too new for me, so I feel more comfortable with a ranged weapon. I’m sure that will change sooner or later. There’s really no reason I can see why rifle+longbow wouldn’t be a viable option for warriors if a player was so inclined. You would want to reinforce the condition damage focus of the two weapons, and understand that you’re doing a “pressure” style build (with the bleeding and burning damage of the two weapons) but on a warrior, that is incredibly easy to do since the two trait lines (Strength and Arms) that have Expertise and Malice are also the trait lines which have Power and Precision. Essentially, when you’re going “offense” with a warrior you’re pretty much going to cover ALL of the offense options. Simply reinforcing this with the right equipment mods is the only other thing you need to look at, and then you’ve got a very effective pressure build, that can operate at safer distances. The “range” weapons do slightly less dps on first blush, but also have some decent CC options, and with the proper traits and equipment I’m certain they would be quite effective. Perhaps consider taking the Deep Cuts major trait (for even more extended bleed duration) and going with Signets for the healing and at least a couple of the utility skills (the Signet of Stamina was incredibly effective at increasing the frequency of Dodges available to you) and then taking the Deep Strike major trait. This would require at least 20 pts in Arms which would get you 200 increased Precision +40 more Precision for each Signet skill you take (up to 5 for an additional +200 Precision potentially) The passive skills of the warrior signets were quite good imo. You could spend most of your time in rifle (since that’s your preference, and there is certainly nothing wrong with stacking bleeds on enemies – I’ve done it to tremendous effect on a scepter+focus necro) and just swap out to the longbow occasionally for the Pindown and AoE skills as needed. Anything unable to easily and repeatedly remove condition damage (player or critter) would be in serious trouble vs this style of warrior.